It seems that every time I turn around, I see emails, messages, social media, and broadcasts of impending doom. 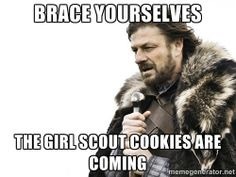 I’m talking about Girl Scout Cookie season. While this may seem like an overly dramatic description of the phenomenon, for someone who is trying their best to maintain a healthy lifestyle and make good, healthy food choices it is the proverbial quicksand… that slide into the dreadful abyss that finds me hiding in a dark corner surrounded by crumbs whispering “My precious…” to an empty box. It can be quite devastating. For all that I have will of steel most of the time, these tiny malicious purveyors of sugary sin cut through like kryptonite knife applied to Superman. It’s horrible, that I can be reduced to such weakness by the mere sight of a Trefoil. As a friend describes the struggle, “It’s when I find myself in emotionally fragile moments actively seeking out Girl Scouts…” Yes… it can be like that. More frequently, though, I find that I can’t escape the young green-clad forces. If I have fair warning, I tend to become a hermit, steering clear of grocery stores, hiding inside my house, and putting my head between my knees until it passes. Sometimes, you just can’t hide. Occasionally the little blighters will get a jumpstart before I’ve had fair warning. I found that the Girl Scout official site has a little script running that allows you to put in your zip code to see when the cookie season starts in your vicinity. They even have an app for that, like a tiny little locator tool on your phone for finding those little food-crack distributors. The problem is that living in certain areas, when one troop ends their season, another begins. It is a constant barrage of the sugar, fat, and flavors. I’ve had so many kind friends try to help me. They say, “Buy them and stick them in the freezer…” Ok, and then what, send the freezer to a foreign country, because honestly I still know where my freezer is and it is not safe from my vampire-like blood-lust for the cookies (perhaps the ingredients in these morsels are not so wholesome as we thought, but more about that later). Sure, those boxes will keep fresh in the cool environment… they will also be easily retrieved in the middle of the night while I devour a whole box of Tagalongs. “Oh,” they say with great sagely nodding, “but you can just limit yourself to a couple of cookies and put the rest away. Portion them out.” Bwahahahahahaha!!! They say it with a straight face, too. I’ve had this same discussion with myself for quite a number of decades now, and I will tell you that if I eat a Thin Mint (any of you ever try to eat just ONE Thin Mint?!? )… I will eat a whole sleeve, if not the entire box. I mean, really. They cannot mean for you not to do so. The cellophane wrapped around those little crisp minty-chocolate wonders meant to keep out air and moisture and maintain freshness… has all the resealability (I totally made that word up) of a Kleenex. It practically dissolves when I look at it, and to my knowledge, I have not yet developed laser eyes. It’s not like you can put them back. When I was finally diagnosed with intolerance for wheat, I thought that I might be safe. Seriously, the glutard in me was going to be my savior from the cookies. But nooooooo. They came up with gluten free offering (Toffee-tastic, who comes up with these names?!?) that won’t hurt my delicate digestive system… while utterly destroying my willpower and mangling my dietary choices. So, I’ve never had a particularly demanding sweet tooth. I never begged for candy or cookies or sweets of any kind as a child. 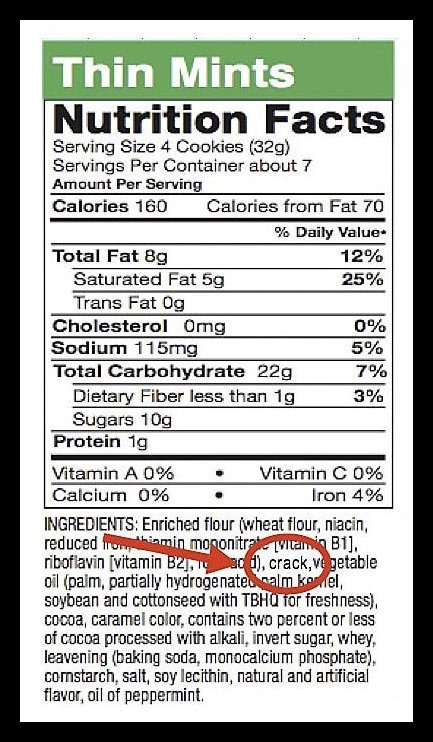 BUT… Girl Scout cookies are different. I cannot resist the pull. If they are out of site, they are out of mind, but as soon as I hear the siren call of “My daughter is selling Girl Scout cookies…” I can’t help myself. I am a ravening beast. I must have the cookies. I turn into a…a… dare I say it… a Cookie Monster. It’s crazy. So, I started thinking to myself. Self, says I… what is it about the Girl Scout cookies. Is there some secret ingredient, addictive chemical that makes me putty in the green-clad hands? So… that prompted a considering discussion. Perhaps, as Wednesday Addams says they are made with real, authentic Girl Scouts. Packed with vitamins and protein? Would that be organic, or would that entirely depend upon the diet of the contributing scout? How can we make sure that we are getting the best quality? Could there be a merit award system (their badges) that might lead to failure to meet their sales quota and so those failing to meet must contribute in other ways? Would that make the quality of the cookie better or worse? In my head, suddenly was imagined the most horrid and twisted version that has ever been considered by the Bros. Grimm. I could hear the discussion among my most deviant chums. “Can I get the nutritional information on these Do-si-dos? I do not think the Girl Scout contributing was fed organic produce.” All in all, I suppose I should be somewhat distressed by my ghoulish turn of mind. I could imagine tracking and hunting of Girl Scouts could take on a whole new meaning. All that being said… the truth is, those small green bedecked creatures with their collections of colorful badges displayed on the sashes across their chests still cause me to avoid eye contact and scurry past the tables laden with boxes for fear that I will ultimately lose control and find myself weary, sated, glutinous heap, and incarcerated from eating 24 boxes of Samoas and blocking the entrance to the Kroger… surrounded by the judgmental stares of the vicious little sales women, their troop leaders, and disgusted passersby. Last night, as I had one of the aforementioned emotionally fragile, nay… unstable moments that led to a horrible (and thankfully rare) instance of vaguebooking on my part, I considered to myself that there may be cookies out there, and used the application on their website only to find that the season has started and there are no table events planned. Salvation, because I’m pretty sure I would have devoured multiple boxes and depleted my bank account to try the new additions to the lineup that I’ve never tried (and would be disastrous for my digestive system): Cranberry Citrus Crisps, Lemonades, Savannah Smiles, Thanks-a-lot, and Trios… I’ll be honest. They can keep the Rah-Rah Raisins. Ew. Since none of the species were in evidence, I was saved from sugar-gluten-chocolaty shame and self-loathing (more so than I was already feeling). It’s a cookie season miracle! God bless us every one! Sorry, that slipped out. Well… that about does it. I’ve poured out my heart concerning the trials and tribulations of the strange craving caused by those devious boxes of confection. Gird your loins and prepare to do battle with your hunger pangs… you will start to see them soon. You have been warned.